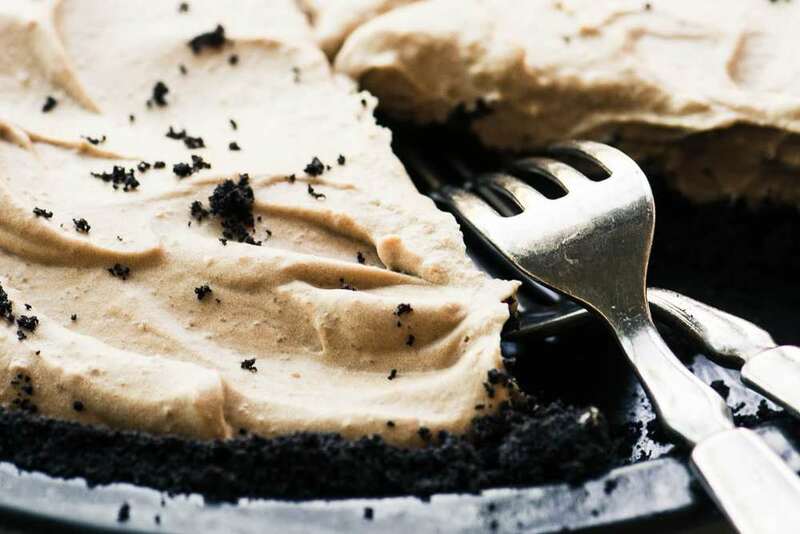 Cold Brew Icebox Pie ~ a deep dark chocolate crumb crust filled with a refreshing cold brew coffee cream, this no bake dessert takes 15 minutes to make! Crush the wafers in a food processor or with a rolling pin. Make sure to get them nice and fine. Toss with the melted butter until well blended. Reserve a few of the crumbs for garnish, and press the rest into a 9 inch regular pie shell (not a deep dish.) If your pie dish is on the small side you might not need all the crumbs. Refrigerate. Whip 1/2 cup of the cream and set aside. Whisk the pudding mix with the cold brew and the other 1/2 cup of cream. Whisk for 2 minutes to allow it to thicken. Fold in the whipped cream until no streaks remain. Pour into the crust and smooth out the top. Refrigerate at least 3-4 hours before serving.